Number six embodies the qualities of seeking balance, being creative and generative, loving and compassionate, having a magnetic radiance, and a sense of service to family and community. The very service-oriented bees who are known for their role in pollination and for producing honey and beeswax utilize a 6-sided beehive honeycomb to contain their larvae and stores of honey and pollen. Water, which is vital for all known forms of life crystallizes as ice or snowflakes in a symmetrical hexagonal pattern and functions as a service agent for all lives and serves many other essential processes like cooking. It appears in three different states: solid - ice, liquid - water, gaseous - water vapor. 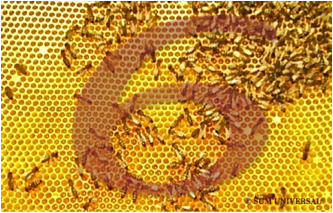 The chemical element that correlates to number six is the non-metallic element carbon, which is found free in nature in three different physical forms called allotropes. Allotropes have different physical and chemical properties. Carbon's allotropic forms are: amorphous, graphite, and diamond. Carbon has the ability to combine with itself to an almost infinite variety of molecules through its complex carbon compounds that exist of carbon-carbon bonds. The amount of carbon-based molecules in nature exceeds the amount of all other molecules combined. Carbon forms after hydrogen the second most compounds with other elements than itself.